Zo, my father and I all love fish tacos! We are constantly on the look out for great ones. I decided it was about time that I give them a go and went with a Southern style take on them. I though our Wasabi Tartar sauce would have been tasty but did not feel it was Southern at all. So I came up with a new Tartar sauce just for these fish tacos! I think my best idea on these tacos was the shredded cabbage over the top. At first I was going to make a cole slaw to go over them but I liked the idea of the cabbage being like shredded lettuce. 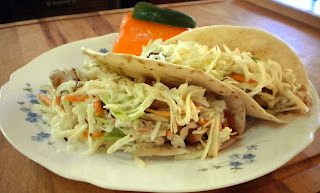 These were pretty darn tasty and if you love fish tacos I think you will enjoy these! Mix all ingredients together in a small bowl and chill until ready to use. Beat egg with hot sauce until even. Heat oil in small 10-12 inch skillet over medium high heat. De-bone and then pat fish dry with paper towels. Dip fish into egg mixture until fully covered and then roll in bread crumb mixture until evenly covered. Press 1/2 of minced garlic cloves into one side of coated fish and press 1/2 of lemon zest into the other side. Place fish in heated olive oil, cooking for 2-3 minutes. Flip fish with tongs and continue to cook for 2-3 minutes or until golden. Remove fish from oil and let sit on plate with paper towel until ready to serve. Repeat steps with remaining fish. Squeeze about a 1 tsp per fillet of fresh lemon juice over fish. Spread a little tartar sauce down the middle of both tortillas. Now slice the fish into large chunks and lay into tortillas. Drizzle a little salsa over the fish, sprinkle with shredded cabbage and then cheese and serve! Those look delicious! I am not usually a fish fan, but when breaded and the seasonings you used - I think I would like these! And I love the addition of horseradish too!